There's a hidden tribute to Walt Disney in "Beauty and the Beast"
Everyone who has seen the live action remake of Beauty and the Beast (so, literally millions of people, and then some) know that the Beast’s castle is no joke. The lavish and ~gorgeous~ castle is so stunning and beautiful, it seems like a historian could pop out of the screen and start telling us the 1000 year history of the palace. 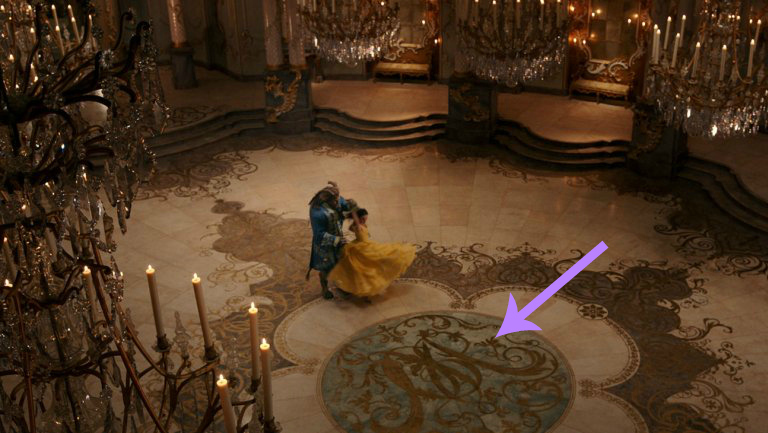 Production designer Sarah Greenwood recently revealed to The Hollywood Reporter that when she, set decorator Kate Spencer, and their team began production on the palace, they placed a small hidden homage to the Walt Disney in the intricate detailing of the palace flooring. Greenwood revealed that the palace floor was made of 12,000 feet of faux marble and in the middle of the floor, the initials W.D. can be spotted — for literally no reason, other than as a tribute to the man who started it all. The Beast has no association to the initials, W. or D., so stop trying to concoct a crazy fan theory right now. It’s just for Walt Disney! Greenwood also opened up to THR about the creation of the castle, saying the team set out to create a castle grounded in reality, as the film takes place in the “real” world, as opposed to a fantastical universe. Greenwood and Spencer used palaces like Château de Versailles and Château de Chambord as inspiration for the over-the-top opulence of the ballroom and drew upon other palaces all over the world as sources of inspiration for various locations throughout the castle. Greenwood also said that part of the difficulty in creating the castle was having to create multiple versions, as the curse on the castle and subsequent loss of human servants changes the aesthetic of the castle from its decadence in the beginning to the dusty abandon look it takes on in the years following the curse. We thought the castle looked absolutely gorgeous and love the quiet homage to Walt Disney embedded in the castle. We’ll have to go back to see the film again to see if we can spot it!